In 1989 the first Dietz Blizzard Lantern was sold and it has remained in ongoing production for over 100 years. 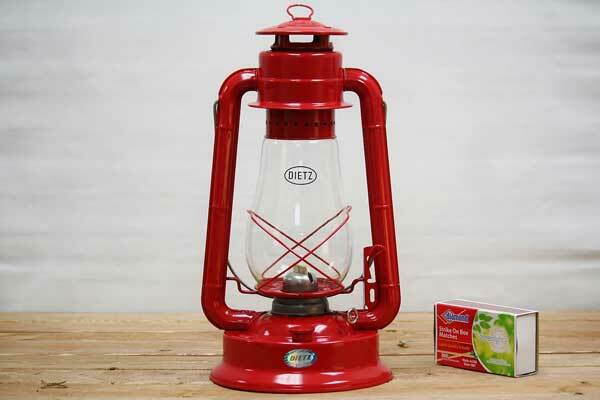 With an average of 12-14 candlepower (maximum 20 candlepower) and burning time of 27 hours, this oil burning lantern is a dependable primary light source. Same streamlined lantern as the Dietz Junior but in a larger body. Rightfully named by prevailing in storm winds. Made by Dietz Lantern Company. This is my second Dietz lantern, the Dietz No. 80 Blizzard in red. They are awesome. Redhill had a great price, they shipped fast and it arrived perfect, well packed. I added Klean Heat kerosene substitute, as I plan to use this indoors as part of my prepping (yes I'm a prepper) waited 1/2 hour, lit it up and it ran perfect. I chose this one for specific reasons, my first lantern was a Dietz Jupiter 2500 in blue, the biggest they make, with an 84oz tank. It uses a 7/8 inch wick as does the Blizzard No. 80. (which has a 31oz tank)...So no need to buy two different width wicks. I just bought a roll of 7/8 and it takes care of both lanterns. The No. 80 Blizzard produces plenty of light. Very happy with it.